We didn't organize any formal event this time. An unveiling of Tetrascroll might merit the term "formal" but that's also work, in the sense of logistics and heavy lifting. This was more a "breezing through" i.e. D.W. Jacobs on his way south in a rental car (Nissan Altima) having landed in PDX one brilliantly sunny (and cold) afternoon. Trevor Blake joined us, my having shared with Doug the viewpoint on my back "flextegrity garden" where numerous specimens of the various versions, especially C6XTY, decorate the space. Sam Lanahan, the inventor, was much in our conversation. In front: the C6XTY pyramid, with the colored lights. Makes my place easy to find, or at least recognize. We're not zoned as a storefront type of business, but managing supranational networks from home offices is perfectly fine, and is what goes on in many a neighborhood. Even working from coffee shops is fine if you make sure you're encrypting everything to the proper level so as not to jeopardize confidentiality. After lunch at the Bagdad, we adjourned to Synchronofile headquarters, cram packed with specimens, mostly articles, books, things of that nature. 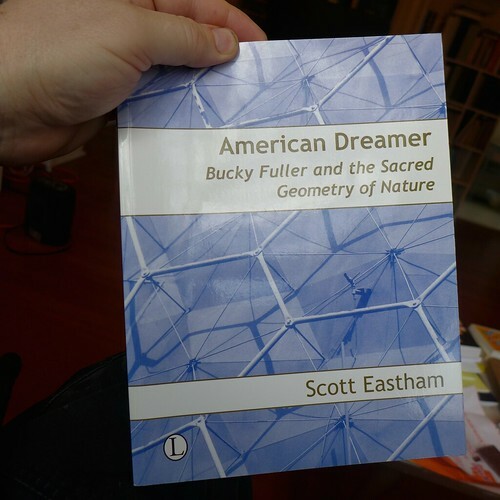 I resolved to finally get my own copy of American Dreamer: Bucky Fuller & the Sacred Geometry of Nature. One of my practices these days is to sweep my radar picking up on sacred geometry teachings that consciously employ Fuller's signature terminology, now that his shop talk is world readable. I'm finding a few, such as Grayham Forscutt. Scott Eastham will help me find more. Doug and I then later adjourned to Back Stage for a night repast. We hadn't seen each other for about ten years, so I had a lot to catch up on, especially with regard to his travels in Eastern Europe. 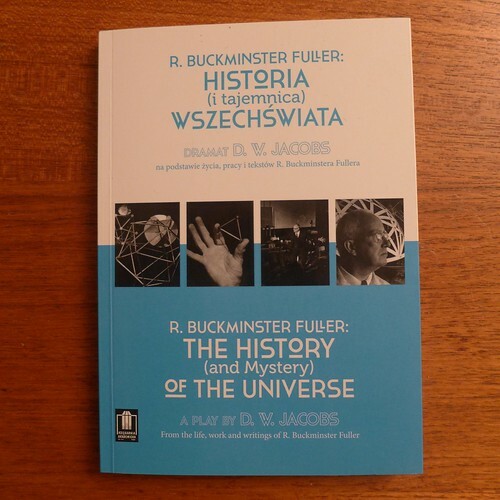 He left me a copy of his play, which play Eastham recommends in his book as a wonderful first exposure to Bucky's thought, in both English and Polish. I talked about Ed Applewhite a lot, his suspicions around est, and my involvement in same. We talked about a lot of movements and surges, political parties, cults, religions, you name it. As contemporaries living through a lot of the same history, it makes perfect sense that we'd be comparing notes on our respective experiential scenarios, partially overlapping, as Fuller used to describe the "time tunnels" or "world lines" or "worm holes" we make through the various dimensions, as "pattern integrities".